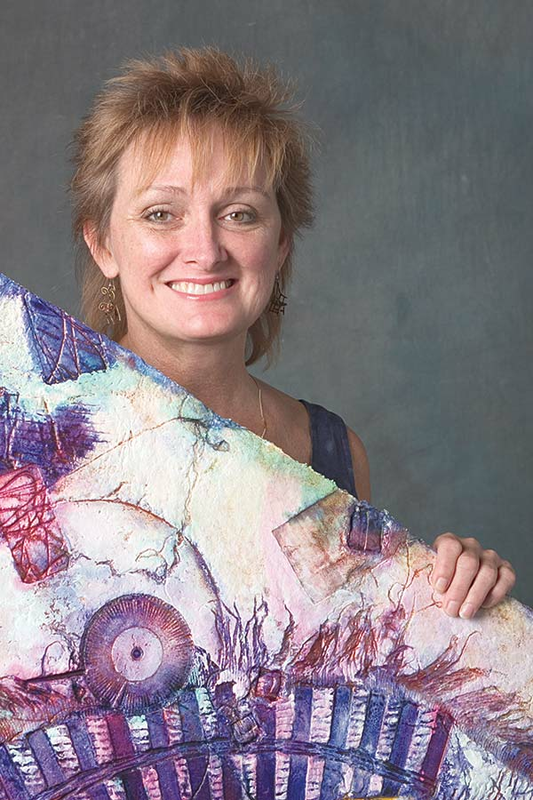 Cyndi Mylynne turns handmade paper into a work of art blooming with eye-catching hues. As one of our featured artists, attendees love watching her paper-making demonstrations. Lined with blenders, her station could pass for a juice bar, but she uses the blenders to combine the fiber, chemicals and colors needed to create her paper. She takes guests through the process –a condensed version – step-by-step from start to finish so they can see firsthand how she creates her art. Cyndi enjoys making her own paper because she can choose her specific textures and colors depending on what she’s working with, whether it’s iridescent shades that glitter in sunlight or muted tones. Each creation is one-of-a-kind, so you know you’re purchasing a handmade original. Cyndi collaborates with her husband, Jeff Adams, on many of her designs. The couple lives in Palmyra, Va., where they run Double Vision Studio.